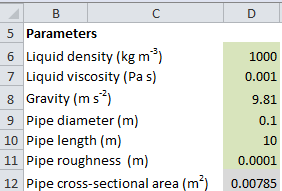 This article will demonstrate how you can balance a pump curve against a system curve to calculate liquid velocity with Excel. First, we'll develop the equations that determine the liquid velocity in a simple pump and pipe system. Then we'll discuss how these equations be solved using Excel's Goal Seek feature. Finally, we'll show Visual Basic code that can be used to automate Goal Seek so that any parameter change will automatically calculate the new liquid velocity. The spreadsheet can be downloaded here, but read the rest of this article if you'd like to understand the theory. Consider a centrifugal pump receiving liquid from a reservoir and forcing liquid through a pipe to a reservoir. This equation now describes the head produced by the pump as a function of the liquid velocity through the pipe. We'll call Equation 4 the System Curve. f is the friction factor, given by the Haaland Equation. The Haaland equation is only valid in turbulent flow, i.e. if the Reynolds Number is over 2500. We can now use Excel to find the liquid velocity that satisfies Equation 7 (effectively determining the intersection between the pump curve and the system curve). 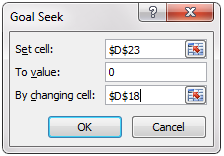 The Excel spreadsheet uses this cell coloring convention. Step 1. 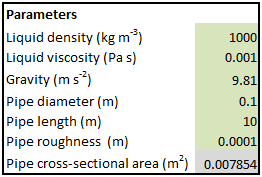 First define the parameters and calculate the cross-sectional area of the pipe. Step 4. Go to Data > What-If Analysis > Goal Seek. Make the changes such that we find the liquid velocity that makes difference between pump curve and the system curve equal to zero. You should now have the correct value of the liquid velocity. Ensure that the Reynolds number is greater than 2500 so that our assumption of turbulent flow (and hence the use of the Haaland equation) is verified. If you're really keen, you can use Visual Basic to automate Goal Seek. Whenever any value in the worksheet is changed, the Worksheet_Change() event is initiated . The VB code then asks GoalSeek() to find the liquid velocity ("C18") that makes the difference between the pump and system curve ("C23") equal to zero.